There are 94 active United States district and territorial courts. Each of the 50 states has between one and four district courts, and the District of Columbia and Puerto Rico each have a district court. The insular areas of Guam, the Northern Mariana Islands, and the United States Virgin Islands each have one territorial court; these courts are called "district courts" and exercise the same jurisdiction as district courts, but differ from district courts in that territorial courts are Article IV courts, with judges who serve ten-year terms rather than the lifetime tenure of judges of Article III courts, such as the district court judges. The district courts were established by Congress under Article III of the United States Constitution. The courts hear civil and criminal cases, and each is paired with a bankruptcy court. Appeals from the district courts are made to one of the 13 courts of appeals, organized geographically. 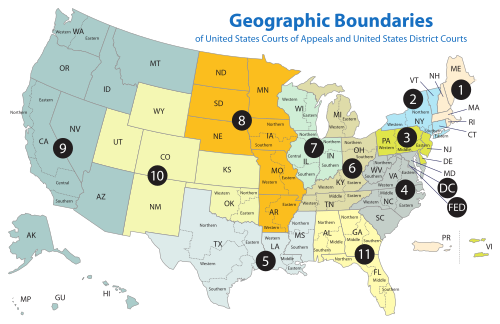 The number of district courts in a court of appeals' circuit varies between one and thirteen, depending on the number of states in the region and the number of districts in each state. The formal naming convention for the district courts is "United States District Court for" followed by the district name. Each district court has one or more meeting places at which it holds hearings and conducts business. Many federal courthouses are named after notable judges, such as the Thurgood Marshall United States Courthouse in New York City or the Hugo L. Black Courthouse in Birmingham. The largest courthouse is the Thomas F. Eagleton United States Courthouse, which serves the Eastern District of Missouri. The largest courts by number of judges are the Central District of California and the Southern District of New York, each with 28 judgeships. The smallest are the District for the Northern Mariana Islands and the District of Guam, with one judgeship each. E. Barrett Prettyman Courthouse in Washington, D.C.
Citation The abbreviation used to refer to court decisions. Established The date the district court was established as a court or the date it was subdivided from a larger district. Judges The number of judgeships authorized for the district. Meeting places The number of locations at which the court hears cases. Northern District of Georgia N.D. Ga. 11th 1848 11 4 Thomas W. Thrash Jr.
Western District of Louisiana W.D. La. 5th 1881 7 6 S. Maurice Hicks Jr.
Western District of New York W.D.N.Y. 2nd 1900 4 5 Frank Paul Geraci Jr.
Southern District of Ohio S.D. Ohio 6th 1855 8 5 Edmund A. Sargus Jr.
Middle District of Tennessee M.D. Tenn. 6th 1839 4 3 Waverly D. Crenshaw Jr. Note: Defunct courts do not include courts consisting of an entire state that were later subdivided. Association of Legal Writing Directors (December 2002). ALWD Citation Manual: A Professional System of Citation (PDF). New York, New York: Aspen Publishers. pp. 431–438. ISBN 978-0-7355-3640-1. Federal Judicial History Office (2009). "The U.S. District Courts and the Federal Judiciary". History of the Federal Judiciary. Federal Judicial Center. Retrieved 2009-05-24. "U.S. Courts | Frequently Asked Questions". Administrative Office of the U.S. Courts. Archived from the original on 2009-02-26. Retrieved 2009-06-02. ^ "United States District Courts". Administrative Office of the U.S. Courts. Archived from the original on 2008-12-05. Retrieved 2009-06-15. ^ a b Article III Judges Division (2001-08-01). "An Introduction for Judges and Judicial Administrators in Other Countries" (PDF). The Federal Court System in the United States. Administrative Office of the United States Courts. Archived from the original (PDF) on 2009-05-13. Retrieved 2009-06-21. ^ a b "Territorial Courts". History of the Federal Judiciary. Federal Judicial Center. Archived from the original on May 14, 2009. Retrieved 2009-06-21. ^ "Thomas F. Eagleton Courthouse". St. Louis - Eastern Division. Retrieved 2009-06-21. ^ California was originally established with two district courts on September 28, 1850; these districts were merged into a single District of California on July 27, 1866. ^ The District of Kentucky was abolished on February 13, 1801 by the Judiciary Act of 1801, 2 Stat. 89, and was restored with the repeal of this Act on March 8, 1802, 2 Stat. 132. U.S. District Courts of Kentucky, Legislative history, Federal Judicial Center. ^ The District of Tennessee was abolished on February 13, 1801 by the Judiciary Act of 1801, 2 Stat. 89, and was restored with the repeal of this Act on March 8, 1802, 2 Stat. 132. U.S. District Courts of Tennessee, Legislative history, Federal Judicial Center.